A company of dragoons were allotted two buglers. One to ride at the head of the column and the second bugler rode at the rear of the column, the latter’s role to relay orders sent from the rear. 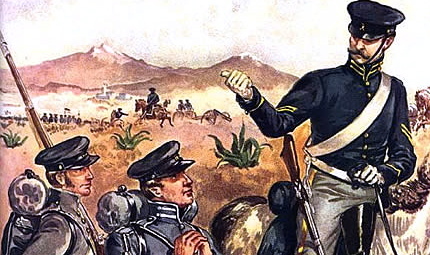 Unfortunately, Company F had no bugler (its only bugler had been discharged due to illness in May of 1847) and, consequently, many of his men did not hear Harney’s bugle call sounding recall and continued in pursuit of fleeing Mexican soldiers. Reaching the gate, the company dismounted and attempted to carry a battery guarding the gate and, would have done so, had Col. Harney reinforced Kearny’s squadron and not have ordered a retreat. On Nov 4, 1848, Keary wrote the following to fellow 1st Dragoon, Lt. John Love. Captain Kearny’s Charge—”The charge of Kearny’s dragoons upon the flying masses of the Mexicans in the battle of Churubusco, is one of the most brilliant and decisive feats which has occurred in the war. As soon as our troops had carried the formidable tete de pont by which the avenue leading to the city was laid open to cavalry, Capt. Kearny’s dragoons rushed upon the yielding masses of Mexicans with an impetuosity and fury which made amends for the scantiness of their numbers, and bore them back in confusion upon the town. The enemy had upon the causeway a force in cavalry four-fold of ours, but the narrowness of the avenue prevented him from availing himself of this superiority, and reduced the conflict to those single-handed issues which the Mexicans must ever yield to our prowess. The audacity of the onset of Kearny’s troops struck dismay to the hosts which fled before them. The retreat became a confused rout, and the causeway was blocked by the entrangled masses of the enemy. But even through this obstacle the triumphant dragoons forced their way, trampling down those who escaped their relentless sabres. Scattering the foe before them, the dragoons came at last within reach of the formidable batteries which defended the gates of the city, and a murderous fire was opened upon them, which was even more terrible to the fugitive Mexicans than the dragoons. The latter continued their pursuit up to the gates of the city, and were shot downmade prisoners upon the very parapets of its defences. This was the moment, if ever, that Gen. Scott might have entered the city, had the instant possession of it conformed to his preconceived design. Already had the inhabitants of the town set up the cry that the Americans were upon them, and the whole population was stricken defenceless by panic terrors. But the dragoons were recalled from the pursuit, and the survivors of that desperate charge withdrew covered with wounds and with honors. 1. Pvt. Patrick Mart, Co. F, 1st Dragoons. 2. Pvt. McBrophy, Co. F, 1st Dragoons. 3. Pvt. James McDonald, Co. F, 1st Dragoons. 4. Pvt. John Ritter, Co. F, 1st Dragoons. 5. Capt. Seth B. Thornton, Co. F, 2d Dragoons. 6. Pvt. Edward Curtis, Co. G, 3d Dragoons. 7. Pvt. Augustus Delsol, Co. G, 3d Dragoons. 8. Pvt. George DeDuve, Co. G, 3d Dragoons. 1. Capt. Philip Kearny, Co. F, 1st Dragoons, se-verely, lost left arm. 2. Lieut. Lorimer Graham, 10th Infantry attached to 1st Dragoons, severely. 3. Capt. A. T. McReynolds, Co. K, 3d Dragoons, severely. 4. Private Cowden, Co. K, 3d Dragoons,. At Puebla, Capt. Kearny wrote to General Scott and requested that thirty men and two buglers be added to his depleted squadron. I have the honour to request that on the arrival of any detachment of recruits that my company be filled to the full number allowed by the Law. My troop is at present 80 men strong, of whom 74 are present. I have the honour to make this request on the grounds of my Company having been filled 111 men, that they had been recruited by extra exertions on my part, and that I was reduced to the number of 81 by order of the Adjutant General, & that now there being authority to fill the dragoon companies to the full limit of the Law, in justice the same number of men should be restored to my that were formerly taken from my command. My troop is an isolated one from the regiment. The full company makes a complete squadron and I am most probably one of the squadron (or first five) captains in my own Regiment, although ranked by all but one of the 2nd Drag. Captains present, although older in service than Capt Hardee, Merrill, of Sibley, three of the 2nd Drag. Captains serving with the army. If these men are granted to me, not a moment shall be lost in rendering them as efficient as possible. My present troop is well drilled. I will not feel the effects of this number [of recruits] being thrown in with them. I am, Sir, Very Truly Yr. Obdt. Servt. [To:] Capt. H. L. Scott, A. A. Adjt. Genl. Kearny lost the use of his left arm due to his wounds and bitterly wrote to his friend, Lt. John Love, of his anger at Harney. In the ensuing months, I shall be posting material on this charge. The first item is a summary of the company’s muster roll written just over two months after the battle. Note that the company was primarily composed of recent enlistees. Lt. Richard Ewell rode with Kearny that fateful day. Here is a portion of a letter he wrote to his brother describing the charge. Captain Kearny was ordered at the close of the fight [at Churubusco] to follow the Mexicans down the the avenue along which thousands of them were retreating. We overtook them about a seventh of a mile from the city gates and I rather think they suffered somewhat. The gate was a good deal obstructed and we pushed them so rapidly that they got into the water on each side of the road. They began firing upon us, and to some effect, too, When we approached the gate, I saw the crowd before us open as if by one movement and I sa a piece of artillery frowning over the works. Captain Kearny had given orders to dismount in such a case and carry the works, but when I looked around, to my horror, I found the Dragoons retiring some distance in the rear. There were three companies in all. Captain Kearny’s leading. Colornel Harney had ordered the recall to be sounded in the rear. AS it took some time for the information to get to the head of the column, they had not being able to hear in all the noise and confusion, we were engaged while the rear was retreating. Colonel Harney had refused to lead the charge and, of course, should not have interferred as it was out of his power to control after we passed him. Only a miracle saved Captain Kearny and myself. He lost his arm by a grape shot after (so great was the confusion) getting in and out of the works. I had two horse shot, one by a musket by the side of the road, the other by a canister shot through the neck. The second was able to bring me back at a walk. Captain Kearny and I came back from the presence of the Mexican four or five hundred yards without further molestation of our troops. Sir: As I was not wounded until the last of the action of the 20th, I have the honor to report of the movements of my squadron (Ftroop of the 1st, and K of the 3d regiments, dragoons.) Twenty-five men under Lieutenant Ewell, myself attending, accompanied the general-in-chief to the redoubt at Contreras, captured a short time previously. 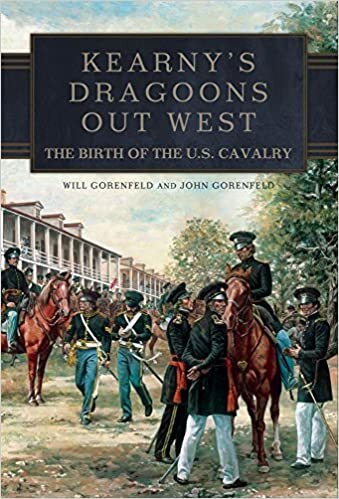 At Cayoacan, coming up to the head of our pursuing column, I was sent with my dragoons and some twenty riflemen under Lieutenant Gibbs, mounted on horses taken from the enemy, to cover Captain Lee, of the engineers, on a reconnaissance towards San Antonio. This place was found to be in possession of General Worth and, his comumns rapidly following up the victory. Returning without delay to the general-in-chief, I was joined by the rest of the squadron, which had been rapidly and efficiently brought up by Captain McReynolds of the 3d dragoons, and received orders to report to General Pillow, and to join in the attack going on on the right; the ground immediately in front was found to be impracticable for cavalry action. During the carrying of the village and redoubt of Churubusco, I moved to the right, hoping to make a diversion and get on the road to the rear, but, finding this impossible, returned to my former position. After the enemy’s works were carried, I was ordered to charge down the road towards the city, after the rereating enemy. On the route I was joined by Colonel Harney with several companies of the 2d dragoons; he assumed command, and directed me with my three troops of dragoons, to place myself and command at the head of the cavalry column; the Mexicans were overtaken soon after we entered on the causeway, bout three-fourths of a mile from the city, and suffered a severe slaughter up to the very gates. Understanding that a battery was on the end of the causeway next [to] the town, I communicated through Lieutenant Steele, A.A.A. General, to Colonel Harney my firm intention to charge it, trusting to their panic to enter with the fugitives. Myself, Lieutenant Steele, and Lieutenant Ewell, together with some dragoons whose horses were over excited, were considerably ahead of the main body, coming full on the redoubt, when the enemy opened a fire of grape upon us, amongst the fugitives, and I gave the command to the men around me to dismount and carry it, presuming that the movement would be observed and followed by the rest of the column. This movement not being understood by our men, and the recall which had been sounded and imperfectly heard from the rear, caused them to halt and retire, but in creditable order. On having been sent to combine with the attack on the right, I was joined by Captain Duperu, with his company of the 3d dragoons, who accompanied me throughout the rest of day, and behaved very handsomely under such fire as we had passed through. Company F, of the 1st dragoons, was the leading one on the causeway, and which explains its severe loss. I have particularly to mention the gallant conduct of Lieutenant Steele, who was constantly at the head of the column, and of Lieutenant Ewell, who had two horses shot under him, immediately at the barricade, and whose conduct in our previous affair of the squadron on the 18th instant, was most conspicuous; also Lieutenant L. Graham, who was wounded, deserves my thanks for his efficiency on this day, as well as the handsome manner of heading a detachment of the company against superior odds on the 12th instant. Captain McReynolds, acting as second captain of the squadron. was throughout the day every way active, and active, and suffered by a severe wound in his arm. But it is to the non-commissioned officers and privates that credit is more particularly due for their conduct here and elsewhere. Statement of loss on the 20th instant. Captain Kearny, loss of arm. Lieutenant L. Graham, wounded slightly. Five privates, company F, 1st dragoons, killed. Fuve horses, company F, 1st dragoons, killed. I am sir, very respectively your obedient servant. Capt. 1st Drag, Com’g. 1st Squad, 2d Bat., Cav. Brig.. Lt. Col. Moore, 3d Reg Drag., Com’g 2d Bat. Cav. Brig. 1st Lt. A. Buford Absent. Never Joined. Place and duty not known. 1st Lt. Richard Ewell Commanding Company. 2d Lt. Oren Chapman Joined from duty 2d Drags. 5 Sept.
Sgt. Fleming Megan 8 Aug. —™46, Terre Haute Sick, Pueblo, Mexico, since 8 Aug.
John Alaways ” ” ” ” Sick, Pueblo, Mexico, since 8 Aug.
John Askins 8 Aug. 46, Shelbyville Detached service, since 31 Oct.
Thomas Bryant 5 Aug 46, St Louis, Sick, Pueblo, Mexico since 8 Aug.
Alonzo Clark 16 May 47, Jalapa, Mexico, joined during march. Philip Frankenberg 6 Aug. 46, Ft. Leavenworth Sick, Puebla, Mex., since 8 Aug.
Augustus Gruber 6 July 46, Fort Leavenworth Sick, Puebla, Mex., since 8 Aug.
Thomas Hall 5 July 46, Jefferson Barracks Sgt. until 29 October. John Harper 28 July 46, Chillicote Stoppage pistol $7.50. Patrick Hart 4 August 46, St Louis; Joined Tabacayo 5 Sept. prisoner exch. Michael Henry 12 Sept. 46, Philadelphia; Joined from desertion 16 Feb 47. Thomas Hewitt 27 Aug. 46, Terre Haute Sick, Puebla, Mex., since 8 Aug.
Martin Howard 11 Aug. 46, Terre Haute Sick, Puebla, Mex., since 8 Aug.
Levi Kimball 1 June 46, Sackett’s Harbor Detached Service since 31st Oct.
Antone Lange 14 Aug. 46, StLouis Daily duty. Wm McAllister 17 Aug. 46, Covington, Ind. Stoppage for 1 blanket $2.22. Wm McCrea 19 Aug. 46, Roseau, Ind. Daily duty. John McDonald 19 Aug. 46, Chillicote Stoppage for pistol $7.50. Anthony Pulver 7 Dec. 46, Corpus Christi; Detached service since 31 October. John Roberts 1 April 47. Vera Cruz Sick at Puebla since 8 August. Frederick Rodewald 16 Aug 46, St Louis Sick at Puebla since 8 August. William See 15 Aug. 46, Terre Haute Detached service since 31 Oct.
John W Smith ” ” ” ” ” Stoppage flannel shirt $1.30. James H Stevens 1 Apr. 46, Vera Cruz. Daniel Suter 6 Aug. 46, Ft. Leavenworth; Daily duty. Clinton Thompson 14 Aug. 46, Terre Haute Sick at Puebla since 8 August. Harvey Thompson 4 Aug. 46, Shelbyville; Daily duty. James Thompson 8 Aug. 46, ” ; Sick at Puebla since 8 August. Joseph Westgenes 17 Aug. 46, ” ” ” ; Sick, Puebla since 8 August. Robert Whitener 27 Jan. 41, Ft. Crawford; Sick Perote, since 25 May. Andrew Whitley 31 July 46, Geldon, Ind. William Wilson 25 Sept. 46, Jefferson Bks. Robert Wright 8 Aug. 46, Terre Haute. Robert Wright of Terry Haute is my great-great grandfather. He returned to Terre Haute where he was a farrier and maintained that profession during the Civil War. Terre Haute, I understand, was a stopping point for union soldiers on their way ? A huge proportion of men from Indiana volunteered to fight in the war with Mexico. They served in 5 Indiana regiments as well as in a number of Federal regiments. Most of these men returned to civilian life after the end of the war.